Spearheading Husqvarna Motorcycles’ efforts at the 2018 Motocross of Nations, Rockstar Energy Husqvarna Factory Racing rider Gautier Paulin has helped Team France secure victory at the 72nd running of the event. Putting in two strong moto performances, Max Anstie played a key role in assisting Team Great Britain claim fifth in the Nations Classification. With the RedBud circuit in the United States hosting the 2018 MXoN, intermittent rainfall throughout the weekend created muddy and demanding track conditions. Yet despite the challenging weather, fans from all over of the world filled the hillsides around the American track. Running the #1 plate on his FC 450 in the MXGP class for Team France, Gautier Paulin got off to a great start in the first race – the combined MXGP/MX2 class race. Involved in some great battles with eventual moto winner Jeffrey Herlings, Paulin claimed a well-deserved overall runner-up result in race one. Getting another good start in the MXGP/Open moto – the third and final race of the day – the Frenchman battled hard throughout the moto to eventually finish third overall and play a significant role in helping Team France top the podium. 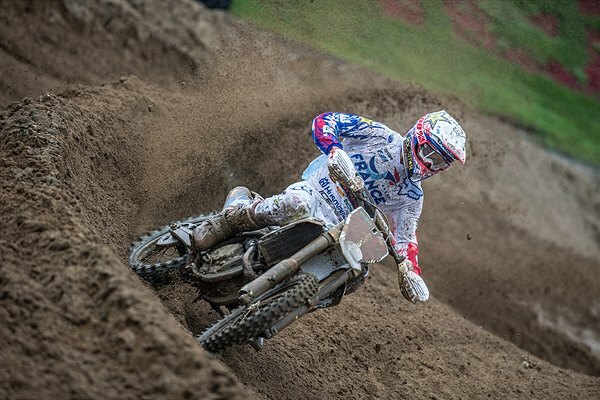 Gautier also claimed second in the MXGP class’ individual standings. Despite mediocre starts in both of his races, Rockstar Energy Husqvarna Factory Racing’s Max Anstie pushed hard in both motos in the Open class. Earning a 13th place result in his first race, the Brit came back stronger to claim sixth in his second moto. Well represented at the 2018 edition of the historic event, 14 riders competed for their respective countries aboard Husqvarna machinery at RedBud. Among them, FC 450 powered riders Tanel Leok and Harri Kullas helped Team Estonia secure ninth in the Nations Classification. Husqvarna mounted Martin Barr was Team Ireland’s highest placed rider and FC 250 powered Ryan Sipes helped Team Puerto Rico earn 19th in the Nations Classification.